These San-o-Sub Valve End Plugs for Rotating Crossbar Manifolds convert the modular valves used with San-o-Sub 200 Bar and San-o-Sub 300 Bar Rotating Cross Bar Manifolds to single right and left valves. These blanking plugs also fit some OMS modular manifold valves, plus those by a number of other brands who actually use manifold valves rebranded from San-o-Sub. 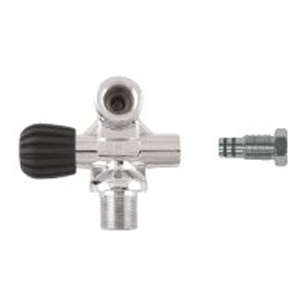 The Right Hand blanking port valve plug has right-hand (normal) threads. The Left Hand blanking port valve plug has left-hand (reverse) threads. It has notches cut into the nut head, so that it can be easily differentiated from the right hand blanking plug.